I will not begin this paragraph with a boring academic quotation. I will not begin it with a sophisticated professional statement either. I will only say that true music is born from freedom and gives freedom to those who listen and understand it. Did you ever watch a bird fly? Did you ever observe the way a tiger is jumping? Did you notice the subtle plastic grace of a sleeping cat? Did you see a river flow? Before talking about piano technique, scales and arpeggios, before telling you the basics of a correct posture, I will tell you a few things about freedom. I always tell my students to find their inspiration in nature. Why look for sophisticated ‘scientific’ solutions when we can simply observe and learn from the wisest teacher – the surrounding universe? I tell my students to be like water, not like rock. Even the solidest rock cannot compete with the free, calm, implacable flow of water. Water can take any form and avoid any obstacles, it can create and destroy, be gentle and be furious, give and take life. Water runs free; it is never stressed, tensed or afraid. Playing piano should be a liberating experience that will bring joy to everyone: to you (the performer), to the public, to your friends and family. Only a holistic approach can help us achieve a true mastery of the necessary piano skills. It will allow us to play freely and to connect harmoniously our mind, our soul and our body. Now you’re probably thinking: it’s nice to talk about freedom, but how exactly do we achieve it? How do we implement all these beautiful ideas in the specific way we play the piano? Here I will try to give you two succinct answers to this question. The first one is the answer given by the great Russian pianist and piano professor Heinrich Neuhaus: freedom, confidence and hard-work are a never-ending circle and a dialectical sequence of quantity and quality: the more you practice, the more confidence and freedom you develop. This is entirely true. However, this is not all. The second answer is the following: there are many other things, besides hard work and practice, which can help you to achieve the much wanted freedom of expression. 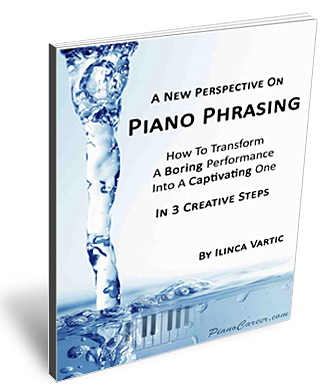 Combined with your daily playing routine, these insights will considerably improve and accelerate your piano progress and, even more important – will help you really enjoy the whole process! There are so many factors that influence the quality of our piano performance! Most performers aren’t even aware of their direct influence. Among others, I can name your inner balance, your physical and emotional strength, your courage, your diet and your attitude towards life. My new perspective on piano playing is the result of more than 20 years of hard work. It’s a holistic system than incorporates psychological research, health and diet advices and physical exercise recommendations. It comes from my own experience in playing and teaching piano, as well as from the experience of my piano professors, who have skillfully combined the traditions of the classical Russian piano school with the latest achievements of the Western musical art. Only a complex approach can help you build a fulfilled piano career that will bring you not only professional and financial accomplishments. By bringing you happiness, it will make your life truly fulfilled. Congrats on the first post. You have some great content here! Highly recommended for all piano and music enthusiasts around the World. They are really wonderful and inspired me a lot! I‘ve been studying piano for 11 years and now I‘m in the 2nd year of the piano major program of the State University of Sao Paulo, Brazil. I‘ve been facing several crisis since I started university and your thoughts gave me a true light…it all has to do with your mind. It‘s impossible to be confident with a lot of negative thoughts and doubts running around. Thanks for showing me this new path! PS: I wish Moldova wasn‘t so far from Brazil! During my studying years, I’ve been struggling as well with many problems connected to my piano practice – stress, lack of motivation, negative thoughts, health issues etc. Since most piano professors only teach us HOW to play and not WHY we should play or how to find joy and purpose in your practice, I decided to let go of stereotypes and find a new approach or, as you say, a new path :). You’re absolutely right – it’s all in our mind! We can find ourselves only by doing things that bring us light, joy and inspiration! With a correct holistic approach we can transform our piano playing into a true life-changing experience. Good luck and enjoy every step of your practice! Privjet, Ilinca. Great blog. Really. Inspiring. I’m a self-though piano-player (wouldn’t dare say “pianist”… yet), learned from passion and because of love for music. Do you think it would be almost pointless and possibly frustrating rather than fulfilling to start at 39? What approach would you recommend? What I will say may sound like a cliche, but it is still the simple truth: It’s never to late to follow your passion and make your dreams come true! Yes, many piano teachers consider that it’s best to start practicing classical piano during the early childhood in order to attain high levels of piano mastery. However, it’s never too late to become a fairly good piano player and to be able to perform very well all the pieces that you really love – no matter if it’s Bach, Chopin, Mozart, Schubert, Debussy or even the fascinating Rachmaninoff! Yes, children are more intuitive and their fingers are more malleable, but they lack the depth of understanding of an adult – that’s why adults can progress faster if they really want it! Learning to play piano is not easy, but it can be extremely enjoyable if you have the correct approach – practicing because you LOVE what you do!!! The main difference between ‘pop’ and ‘classical’ piano playing is the quality of the sound, therefore the posture and the touché. In classical playing, the arms and the wrist should be extremely relaxed and flexible in order to achieve a beautiful, deep and expressive sound. I suggest you to take at least a couple of lessons from an experienced classical piano teacher who will show you the correct posture and gestures. While it is possible to learn all the musical ‘grammar’ all by yourself, you still need practical lessons for understanding some playing principles that cannot be explained in a book – you have to see them and ‘feel’ them. I’m a 21-year-old piano student from Uruguay, and I have to tell you that I completely agree with what you say! The idea of music as a spiritual keyhole to the forces of the Universe seems to be very true. I’m trying meditation to develop my concentration, tranquilize my anxiety and try to be able to free my creative powers from constant fears, especially those of public performance. Thanks again for your very well articulated words. It rings true with the exciting energy of a fulfilled life and its powerful mythological implications, a thing Joseph Campbell has talked a lot about. Have a great year! You live in a very beautiful country! BTW, you’re very beautiful yourself! Thank you for your comment and welcome to PianoCareer.com! 😉 It’s very nice to meet you! I’m really glad that you liked my article and my holistic perspective on music, piano playing and life! I agree with your statement of the lazy syndrome when comes to wrist problems, I would like to add that it is also perhaps practicing difficult music sporadically instead of having a daily regime. Loving the piano is similar to falling in love with love-I can not find a better way to explain. I am trying to learn the g minor Chopin’s Ballade and still didn’t get down to it. I am old, turned 69 and would like to master the g minor Ballade before I meet my maker. Any suggestion how to proceed with this great endeavor? This is SUCH a complex question – it would probably take me a couple of months to explain how to learn this beautiful Ballade in detail! So the only way I can help you in your piano quest is through my Piano Coaching Program – where you can find hundreds of exclusive video and written tutorials where I share the professional principles of the Russian piano school. The tutorials are focused on an extremely wide range of piano topics: posture and key attack, sound and expression, technique, teaching, correct practice, performance, repertoire (including lots of downloadable scores, method books and other useful resources), detailed practice recommendations for specific pieces, health, motivation etc. Although I am already a member of your forum I only today came across your presentation on “How to Handle Failures in Piano Playing,” and it was almost a life saver as I have been contemplating the same question as the 69 year-old wannabe pianist: ‘Why am I bothering with this anyway?”, and even thought of selling my piano so that I would no longer be tempted with trying, etc., and then I came across your reply to the 69 year-old man who had similar thoughts of “why bother, and to say it is an inspiration would be an understatement. I hope I can print it out for future reference. Thanks a lot for this encouraging article.